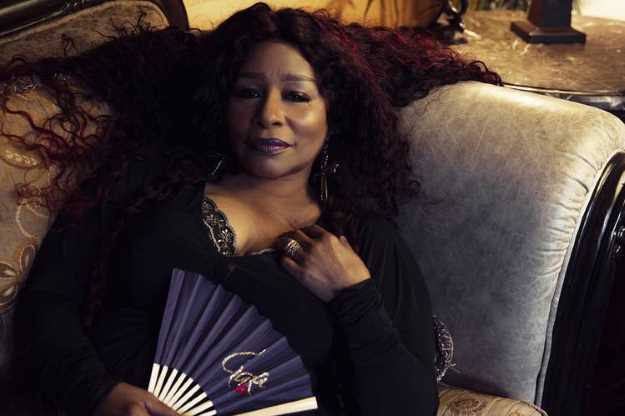 On a recent Monday afternoon at her Los Angeles home, Chaka Khan, the legendary rhythm and blues singer known for her iconic big voice, was fussing over her just-as-iconic big hair. "I started out with orange and stuff like that in the '80s and I've settled into this beautiful rich red," she explains. "But now I can't go anywhere and not see my red on somebody's head! So now what do I do? I'm gonna do something different." The 10-time Grammy winner, who turned 65 in March, is embarking on another new adventure this year as she releases her first solo studio album in 11 years. In June, she put out its first single, "Like Sugar," a sensual, funk-tinged bop. "I play drums on it too," she volunteers excitedly. The song's chorus encourages listeners to "get up on your feet" and the album shares that vibe. "It's the first time in my career I've ever purposely gone into a studio to make a dance-music album," Ms. Khan says. "I live in the real world and these kids want to dance, so I wanted to give them something to dance to." People have been dancing to Ms. Khan's music since she burst on the scene in the early 1970s, as the lead singer in the pioneering multiracial funk band Rufus. She gained a following for her impassioned vocals that soared into open-throated wails, her exuberant stage presence, and her sexpot-meets-hippie-chick style. The group's hits included "Sweet Thing," and the Grammy-winning single "Tell Me Something Good," written for her by Stevie Wonder. Ms. Khan went on to record solo hits including the anthem "I'm Every Woman" in 1978 and, in 1984, a lively cover of Prince's "I Feel For You," featuring Mr. Wonder on harmonica. 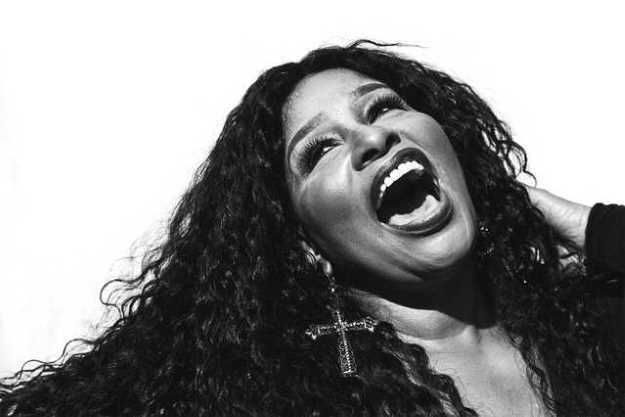 The latter's opening repetition of "Chaka Khan, Chaka Khan," a recording room slip-up purposely left in by the producer, remains a pop-culture catchphrase. The singer-songwriter's 22 albums span funk, soul, pop, rock and jazz. She has worked with such luminaries as Miles Davis, Dizzy Gillespie, Quincy Jones, Ashford & Simpson, Babyface and Chick Corea. Born Yvette Marie Stevens in Great Lakes, Ill., in 1953, Ms. Khan grew up in a working-class neighborhood in Chicago. Her mother was an administrator at a University of Chicago research center, and her father was a freelance photographer; they split when Ms. Khan was about 10. Music played a big role in her childhood, from singing on Saturdays while cleaning the house to performing for her mother's friends at parties. In talent competitions, she earned the nickname "Little Aretha." She ventured into Afrocentrism in her teens, joining an African culture band called Shades of Black and being christened "Chaka" by a West African high priest. She joined the Black Panther Party. She also immersed herself in the Chicago music scene, singing in different bands and picking up the last name she still uses from her brief first marriage, to musician Hassan Khan. In 1972, she became the lead singer of a hot local rhythm and blues band then called Ask Rufus. A record producer caught their act, and pitched the group to a friend at ABC/Dunhill Records, which offered the group a contract. The group became known as Rufus featuring Chaka Khan. As her band's star was on the rise, Ms. Khan struggled with drugs. Constantly on the road touring, she left her infant daughter behind with her mother in Chicago, she recounts in her 2003 autobiography, "Chaka! Through The Fire." She took drugs to numb the guilt and anger she felt, she writes, and got high whenever she felt lonely, or doubted whether men liked her for herself or her fame. A turning point came in the 1990s. While trying to resist doing more drugs after a night of "binge drugging and drinking," she writes, she thought back to a time when she showed up high to an art program for kids. The memory helped motivate her to enter rehab. In 2016, shortly after the death of Prince, who had become a good friend, Ms. Khan again entered rehab for addiction to prescription drugs. She was back on the road a month after completing her treatment. She has also recalled trouble with overspending, writing that she and her second husband "ran through money as if it really did grow on trees," splurging on two Mercedes convertibles, a Jeep, one of the last original-style Volkswagen Beetles, pricey original artwork and exotic animals. Today, Ms. Khan has a new online series on YouTube called "The KHAN Knows." The show includes her talking about her career and life, conversations with friends and celebrities, and question-and-answer sessions with fans. "I've acquired a fair amount of life experience and I want to share with some of the younger people," she says. When she isn't working, Ms. Khan says she is "a real book fiend. I love the feel, the smell-I have a visceral connection with books." She was recently reading Rhys Bowen's "The Tuscan Child" and was excited about a recent TV adaptation of Caleb Carr's "The Alienist." Ms. Khan has been fond of saying "TV is my boyfriend" in recent years, adding that her bed is her husband. She declines to give any details about current relationships beyond noting that "things have changed since then, and that's all I will say." With her current album, the singer-songwriter had to come around to today's dance genre. "I've done a few gigs where I have DJs and remixers open for me and I was wowed," she says. "There was a time when my thinking was old school. I was jazz-oriented. I just was not open to it." DJs today, she adds, "are making this music attractive to all age groups." Ms. Khan continues to perform live, on tours, in festivals and for specials world-wide. Her distinctive voice, which Miles Davis likened to his horn playing, remains in good shape: She sings songs like "I'm Every Woman" live in the same key as the original. "It's a gift God has granted me," she says. "It's what I have to give from my heart. It's a blessing." Still, after a bout with acid reflux, she has cut down on touring to half as much as last year and now takes two nights off for every two nights she sings. She credits good sleep with helping preserve her voice. She knows that there are some songs her fans always want to hear. "I have to perform 'I'm Every Woman' and 'Ain't Nobody,' " she says. If there's a song she's tired of performing, Ms. Khan wouldn't say. "I still enjoy some of them, but it all makes up for it when you see how much enjoyment the people are getting out of it," she says. "That's everything."